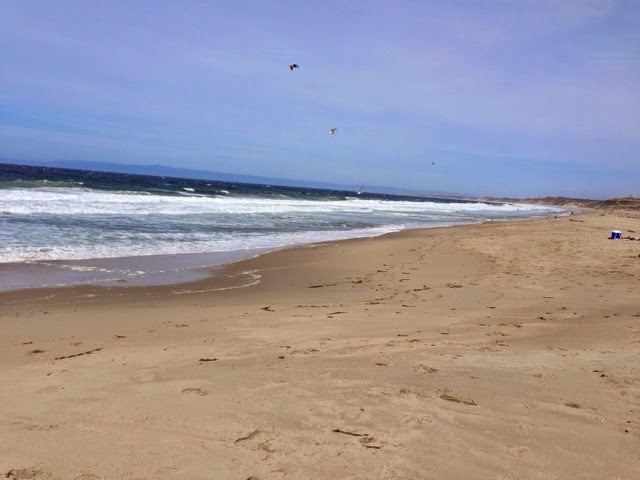 My trip to Monterey Bay again for my travels has two main purposes. First is to visit my son and family before I make the trip across the country back home. 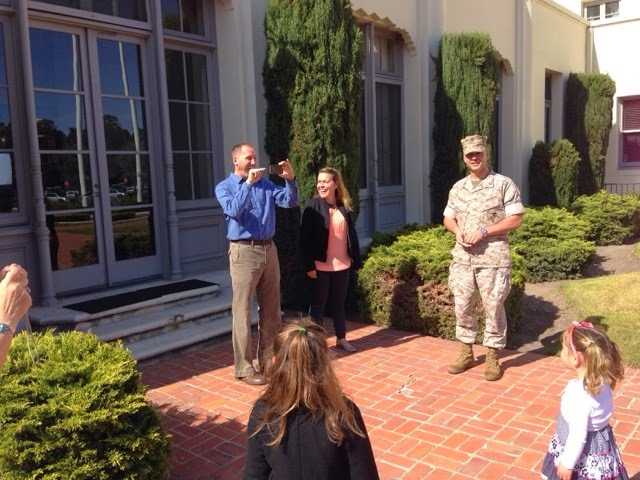 Second, is to attend and celebrate Son Clayton's promotion to from Marine Captain to Major. Clayton decided on a career in the U.S. Marines back in High School. He graduated at 17 and needed parental approval to head off directly to boot camp to be in the Marine Reserves over the summer before going to college in the fall. There were signs when Clayton was growing up that he may want to have a career in the Millitary, but he was quiet and surprised us a bit. The airplanes hanging from his bedroom ceiling was a clue. He completed college before his truck unit ws called up for the invasion of Iraq in 2003. After his deployment he was released by tye Marines due to a process they use to rotate personnel. 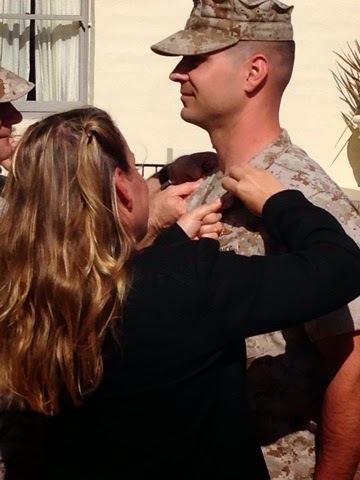 He was frustrated about this adminstrative process and went immediately to the Marine Recruting Center and with his college degree he enlisted in the Marine officer school after taking the placement test. He wanted to fly in a fighter jet and he was selected for the 2nd seat of the FA18-D which is the weapons and navigation officer because of his eyesight. There is a lot of Marine acronyms that I will not try to remember or explain. Although selected you don't always make the grade in other ways. 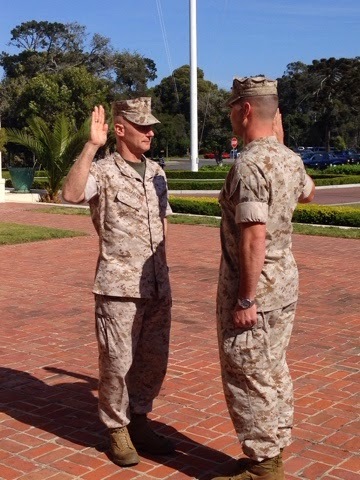 He needed to pass Officer Training School in Quantico, VA. He did very well there and was selected to continue to FA18 fighter training at Pensacola, FL. He pass flight school and he did get his selection and was assigned in a FA18-D squadron in Marine Corp Air Station in San Diego, CA. He made many deployments, for 6-8 months at a time, with one back to Iraq. He was also gone many weekends on training flights. This took him away from his family a lot and we all missed him. 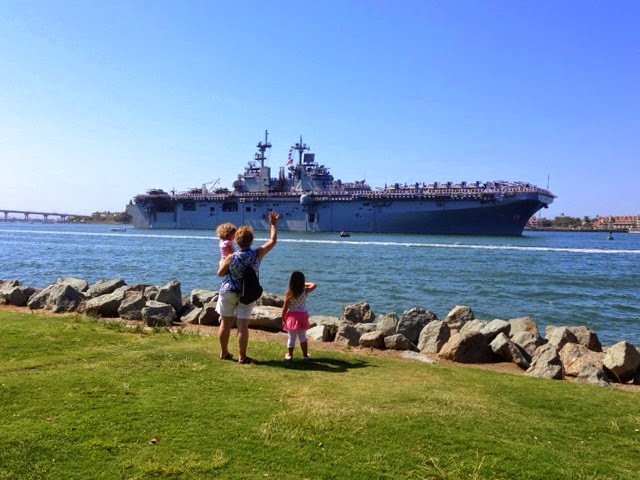 He more recently, before he came to this assignment, was assigned a flight officer on the USS Boxer that was deployed to the Middle East. Computer Science. He is now about half way done. He came up for promotion Major and had been waiting and the Marines have been slower to promote in general lately. Finally, he was put on the promotion list for April 1. 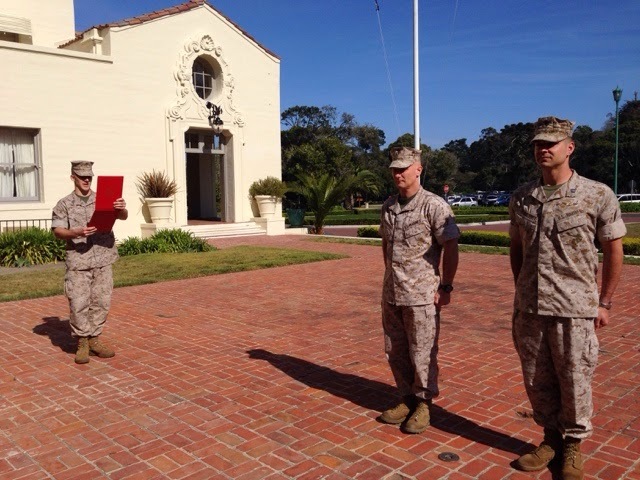 Being assigned to the college means he is not part of a units promotion ceremony and with a strong push from his mother he set up this modest promotion ceremony with the commander here at the college. The commander and Clayton's wife pin the Major pins on his collars after the commander said a few words and the promotion order was read. 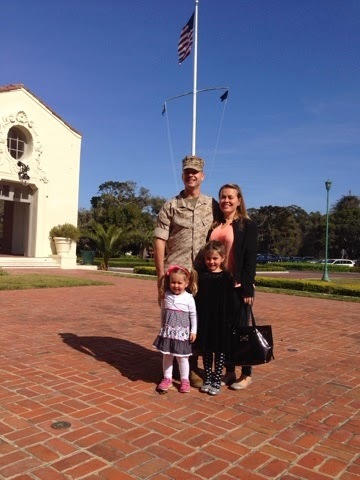 Here is U.S. Marine Major Clayton C. MacAloney. His girls are all proud of him as well as his parents. We have been to a number of the steps along Clayton's career but this is the first in some time. With his promotion he will have different types of jobs once he graduates next year from the NPGS here. We plan to be back for his graduation next year and visit him no matter where he ends up being assigned.